One of the benefits from my job is being able to take off Fridays in August. The office is slow, so I don't need to be there as much. I love having a three day weekend, being able to have an extra day of the Saturday morning feeling (my absolute favorite time of the week), and having enough bright sunlight when I cook to take photos! Here's recipe I found online and adapted to my liking. 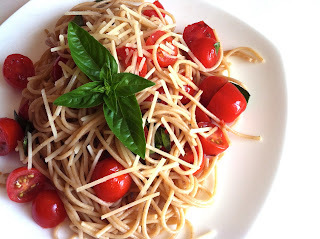 It's fresh and light, perfect for a summer lunch or dinner. 1. 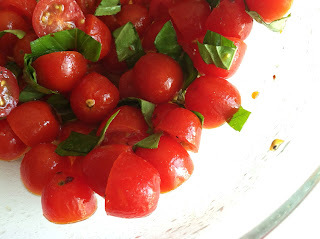 In a large bowl, place the cherry tomatoes, olive oil, garlic, basil, crushed red pepper, salt and pepper, and toss to coat. Cover the bowl and let sit at room temperature for four hours. 2. Prepare pasta. Drain and add to the tomato mixture. Add cheese and toss to coat. Garnish with basil and extra cheese.